New limited-overs captain Colin Ingram says Glamorgan play the "right brand of cricket" to win a title. 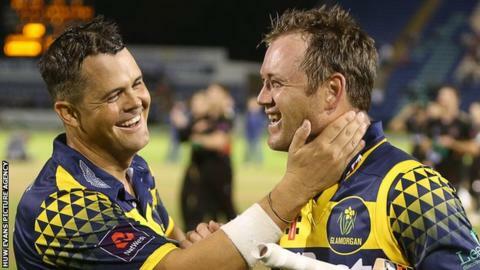 Glamorgan reached the T20 Blast Finals Day in 2017 after a quarter-final appearance the previous year. "I think there's a great atmosphere around our white-ball cricket and for me it'll be about building on that," said Ingram, who has skippered his South African side, Warriors. Michael Hogan continues as Glamorgan's County Championship captain. The Welsh county are also working on an overseas signing to replace Rudolph at the top of the batting order. Former South Africa international Ingram, Glamorgan's overall player of the year and the UK's most valuable player in the One-Day Cup, replaces compatriot Jacques Rudolph, who has retired. "I think we're playing the right brand of cricket, through the last couple of seasons we've learnt a lot when we've got to the back end of competitions in play-off games, so hopefully we can keep building on that and we'd love to win a trophy," Ingram - who plays for Glamorgan as a non-overseas player under the Kolpak ruling - told BBC Sport Wales. "I feel confident in the job, and it really means a lot to be working with a bunch of guys I enjoy and a club that's been good to me. It's about creating a good environment and giving the team direction." Ingram, who made 40 appearances for South Africa in all formats, is due back in action for the Warriors in November after suffering a side injury on Glamorgan duty in September. But the 32-year-old batsman and leg-spinner is disappointed plans for the new high-profile T20 Global League in South Africa have fallen through, after he signed for the Johannesburg Giants franchise. "There was a great need for that in South African cricket, to have their own global tournament, and there's been a really down feeling in South African cricket in general with the news," Ingram added. "I think it's done damage to our reputation as well, and the players were excited to be put on the world stage and to stage claims for world leagues. "South Africa's a strange old place, but we still produce really good players so hopefully we can rectify that in years to come and still put on that tournament." Ingram will now take part in the domestic South African competitions, before heading to Australia in December to play for Jason Gillespie's Adelaide Strikers in the Big Bash.